It isn’t often that I get to write about a smartphone app that’s actually going to save lives. Which is why I’m so excited about this story. 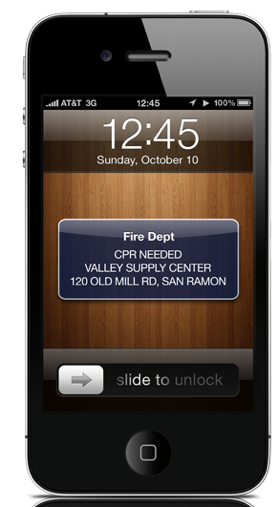 Right now in the San Francisco suburb of San Ramon, California, a press conference is being held to launch a new version of the somewhat generic sounding iPhone application Fire Department. In attendance are Fire Chief Richard Price, International Association of Fire Chiefs (IAFC) President Jack Parow, Workday CEO Dave Duffield (who also cofounded PeopleSoft), and Tim O’Reilly of O’Reilly Media. It’s an interesting mix, and it may be the start of a very important campaign that could save many lives. Here’s the gist of the app: you launch it, and it prompts you to ask if you’ve been trained in CPR and would be willing to help a stranger in the event of an emergency. If you accept this, then the application will take advantage of the iPhone’s location monitoring to get a general sense of where you are (a new feature enabled with the most recent update allows this with a minimal amount of battery drain). Then, the next time a 911 dispatch center receives a call for an emergency that’s occurring near you, you’ll receive a push notification telling you that help is needed. The app will also tell if you if an automated external defibrillator (those electric paddles that can kickstart a heart) is nearby. It sounds simple, but it could be extremely effective. Survival rates for people who need ambulance assistance during a heart attack are depressingly low. Each minute is absolutely crucial, but it typically takes 8 minutes or more for an ambulance to arrive. CPR during this time, even from someone with basic training, can make the difference between life and death. What’s worse — there are AEDs all over the place, including public areas, airports, libraries, and businesses. But nobody ever knows where they are, so they often go unused. This application could change that. The project has been spearheaded by the San Ramon Valley Fire Protection District, where it’s being led by Chief Price and Lucas Hirst (who is actually a friend of mine from high school). Update: We should note that development of the iPhone application has been handled by interns at Northern Kentucky University’s Center for Applied Informatics. 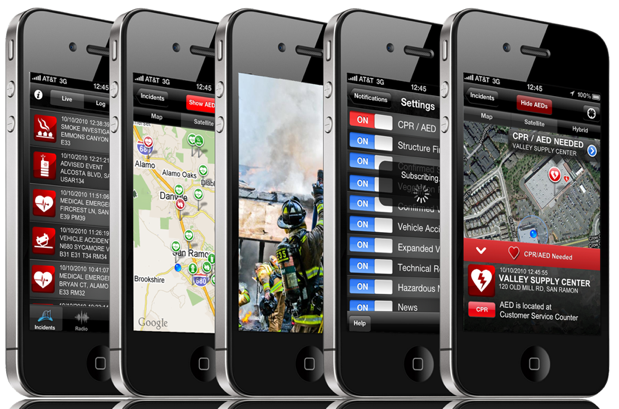 The app itself has existed for some time, with basic features like being able to monitor current emergencies in the San Ramon area. And now they’re hoping to turn it into something much bigger. To do so, they’re in the process of creating a foundation to oversee the initiative. Workday has pledged to help them develop mobile applications for additional platforms. And everything will be open sourced. Hirst tells me that they really want to do this right — they don’t want to make money, they want to save lives. There are plenty of logistical hurdles involved. San Ramon Valley’s fire department is more advanced than many of the other stations across the country. For example, it has a database of every AED and an accurate description of their location (under the checkout counter at Macy’s), while many regions have no list or just vaguely list the name of the venue (“Airport”). The system also requires 911 dispatch centers to add support for the service, though Chief Price tells me that these systems are often augmented with such relay systems, so it isn’t unfeasible to add another one.